In the early twentieth century with the blessings of most of the English bishops, Msgr. Ronald Knox embarked on an entirely new English Bible. It was to be based upon the Clementine edition of the Latin Vulgate of St. Jerome, but Knox consulted the texts in Greek and Hebrew where necessary in order to ensure the accuracy of the translation. In his On Englishing the Bible, Msgr. Knox explains how he carried out the mandate given to him by the English hierarchy. He aimed at a Bible that was understandable to modern audiences and yet rooted in Catholic tradition and “written in timeless English”. He wanted a Bible that did not merely translate the original but made it read as if an Englishman had written it. It is unquestioned that for the past 300 years the Authorized Version has been the greatest single formative influence in English prose style. But that time is over …. 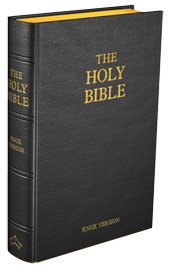 When the Bible ceases, as it is ceasing, to be accepted as a sacred text, it will not long survive for its fine writing. It seems to me probable that in a hundred years' time the only Englishmen who know their Bibles will be Catholics. And they will know it in Msgr. Knox's version. His three aims were: accuracy, intelligibility, and readability. He was loyal to these principles without sacrificing the rhetorical power of the original and while deliberately keeping a few of the well loved archaisms in the text. He preferred lucidity to poetry, but as one of the finest literary craftsmen of 20th century England he avoided falling into banality. This was particularly so in his unique respect for the Hebrew Acrostics (starting successive verses with successive letters of the alphabet). Here Monsignor Knox respects the 22 letters of the Hebrew original but starts his verses with successive letters of the English alphabet, usually leaving off X, Y, and Z and one other letter, often Q. The result is unique. The Knox Bible is firmly rooted in the text of the Clementine Vulgate, the Latin Bible that was the Catholic Church’s official bible for nearly 1,600 years; and yet was Knox was careful to cross check his translation against the Hebrew and Greek texts. In readability and scholarship it firmly belongs to the age of modern bibles. It is an opinion that may have particular application to the pauline epistles. Regarding these I do recall some early critic who, while conceding that Msgr. Knox had certainly made St. Paul intelligible (he was at times barely so in the old Douai-Rheims version), still doubted whether Knox's version really makes Paul say what he actually wanted to say... I am not scripture scholar enough to resolve the question; but am sure that the same doubt can be made extensive to quite a few more recent versions. In the Old Testament, the Wisdom books are particularly expressive. No translation of the Psalms is going to please everyone. But it is worth examining Psalm 118, for instance, where Msgr. Knox stood fully up to the particular challenge its translation represents. To my mind, the result is a tour de force. Consider also the Major Prophets. I find the first chapters of Isaiah and of Ezechiel specially remarkable. The poetic tone of the Psalms and other poetic books changes to something more resoundingly epic – as indeed befits prophecy. Prophecy is meant to surprise; it is dramatic and emphatic. And Knox's rendering of Isaiah or Ezechiel – idiosyncratic if at times it be – certainly brings out the solemn force of God's word on the lips of his prophet. It strikes the listener, and one is more inclined to stand up and take notice. As it should be. When working from scanned pages, it is difficult to spot and correct all the errors. The New Testament has been subjected to very careful correction over these years. I will be very grateful to those who point out any errors they spot in the Old Testament. Pope Pius XII, in a note that he sent to Msgr. Knox shortly before Knox died, called it “a praiseworthy achievement … a monument of many years of patient study and toil.” Novelist and Knox’s fellow convert Evelyn Waugh predicted in the middle of the 20th century, when the literary influence of the King James Bible and its sonorous cadences were waning fast, that in a hundred years’ time the only biblically-literate Englishmen will be those who are Catholic, and that they will know it through the Knox translation. The Ven. Fulton Sheen notably favoured the Knox Bible as the source for his biblical quotes, and even though it has not been in print for a number of decades, interest in it has never ceased. Waugh’s prediction may have seemed quixotic in the past 50 years, but today’s hunger for a measured return to beauty and reverence may mean that it will yet come to pass. We must never forget that all authentic and living Christian spirituality is based on the Word of God proclaimed, accepted, celebrated and meditated upon in the Church. You are allowed to use any of the text on this website to promote the Knox Bible.